March 1st, 6:30 p.m. RSVP Today! 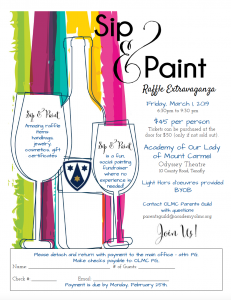 March 1, 2019 6:30 p.m.m to 9:30 p.m. is OLMC’s Paint and Sip Raffle Extravaganza in the Odyssey Theatre! Amazing raffle items include handbags, jewelry, cosmetics and gift certificates. Sip and Paint is a fun social painting fundraiser where no experience is needed! $45.00 per person Tickets can be purchased at the door for $50.00 (if not sold out). Light Hors d’oeuvres provided BYOB! Payment is due by Monday, February 25th.